Golden Chariot, the Indian Luxury Train in association with The Tourism Department and the Karnataka State Tourism Development Corporation (KSTDC) offers a special tour package for the upcoming Dasara festival. The Dasara Special Package (two nights and one day) is available for the dates of September 23-25 and September 29 to October 1. The special package is available at a discounted price of Rs 25,000 for Indians and Rs 40,000 for foreigners. The Dasara special journey will start from Yeshwanthpur railway station in Bengaluru on the night traveling to Mysuru and back to Bengaluru on the third day early in the morning. 88 passengers can board the train for each trip. South India’s first and only luxury tourist train run by KSTDC, the festival special journey is a cherished experience. Endowed with lavish accommodation, decor inspired by dynasties from Karnataka’s past, fine dining and royal service by uniformed attendants, the Golden Chariot offers guests to explore the rich heritage of Karnataka and enjoy the pleasures of royalty on wheels. Priyank Kharge, Minister for ITBT and Tourism, Government of Karnataka said the new journey at great discounts is a good initiative. Not only will guests have the an excellent opportunity to people to experience royalty on board, which would showcase the state festival of Karnataka ‘Nadahabba’, The Mysuru Dasara and its grandeur. Attend the royal festivities of Dasara as a royal guest and experience the exciting train journey at a subsidised cost. 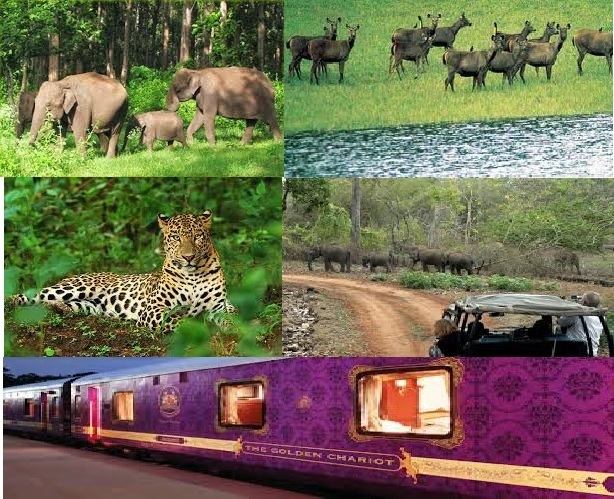 Golden Chariot is an Indian Luxury Train operated by KSTDC. The heritage train covers the cultural legacy of Karnataka. Passing through ancient history, cultures, UNESCO World heritage sites, and many more. Palatial architecture and rich detailing of temples are blended in the carriage interiors with the finest modern facilities. There are 19 specially-designed coaches, 11 of the carriages with accommodation, 2 restaurants, recreational coach, conference car and other delights. 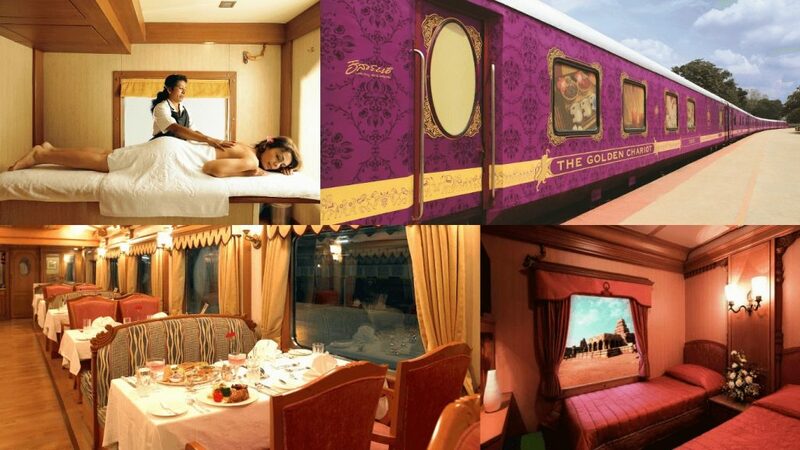 India’s top luxury train, Golden Chariot announces to host luxury weddings. The Karnataka State Tourism Development Corporation (KSTDC) addresses the growing demand for destination weddings offering Karnataka’s plush train coach, Golden Chariot to host destination weddings. The luxuriously appointed coach has already hosted weekend getaways and corporate outings and is now working on introducing wedding and honeymoon packages. 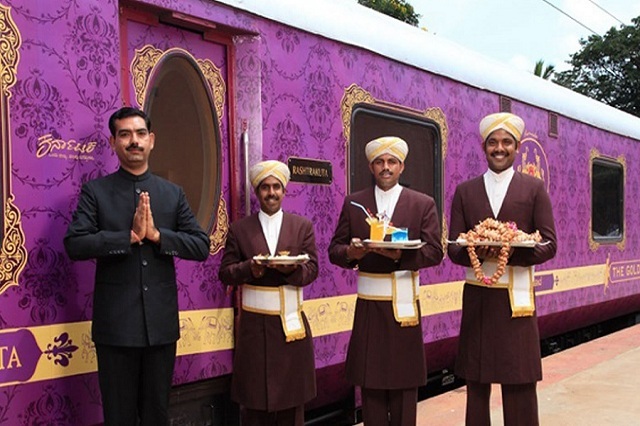 An official said, this is the first time that a luxury train will host a destination wedding. Many people around the world are keen on making their wedding a small affair at an exotic place, therefore this is the perfect opportunity to capture the growing demand for destination weddings. These initiatives by KSTDC hopes to further business and profits of the Golden Chariot. It is also talking to the railways to fix the haulage, and the fee to be paid only for use of the tracks. The plans to host the destination wedding also include other details. Once a party books the train for wedding, KSTDC will arrange for decorations, hire transport from the railway station to the wedding hall, and even book priests. The organisers will also take care of pre-wedding rituals such as sangeet, mehendi and reception. Decorations and cuisine can be customised according to one’s requirements. The train plans to offer a variety of national and international alcoholic and non-alcoholic beverages. Guests and family will be ferried around in luxury AC buses, while the couple are driven around in posh cars. If the package covers it, the couple will also be sent off on a honeymoon. Two additional days will be available if they choose to stay at a KSTDC hotel.